A tiny fly taking nectar from a sunflower; click for more detail. As I was photographing the young sunflower shown in yesterday’s post, a tiny yellowish-tan fly landed on it. Lost in thought, or whatever condition an insect is in when it works on a wildflower, this pretty fly paid no attention to me as I focused on it rather than on the sunflower while I kept taking pictures. Had this sunflower not survived the mowing, there would have been less in the field to sustain the fly and other insects that likely also paid visits there. In the enlargement below you can better see that the fly has a bit of pollen on its “beak,” or proboscis. Also notice the pattern of cells on the fly’s compound eyes. Update: in a comment below, Sarah suggested that I submit a picture of this unknown (to me) fly to bugguide.net for identification. In less than an hour someone identified it as Poecilognathus, which is a genus of what are called bee flies because of their resemblance to bees. Wow! What an excellent photograph. Both fly and sunflower are so beautiful; the detail is amazing. Thanks for your enthusiasm. I wish you could meander over to Texas and see our wild sunflowers in person. I can’t guarantee a view of the fly, though: I’m not sure I ever saw this type before. Update: in going through my archives, I discovered that I had once photographed this type of fly before, but I still favor the latest round of pictures. I agree. What a wonderful photo! Very high quality indeed. We aim to please. Thanks. This photo is great, I wish I could get such fine details in the insects that come my way. How do you do that? Thanks, Martina. To get this amount of detail you can either use a dedicated macro lens, which is what I do (I have the Canon 100mm macro); or you can attach a close-up lens (which looks like a screw-in filter) in front of a regular lens; or you can add an extension tube between the camera body and the lens; you can even combine two or all three of those approaches, though that would be extreme. It also helps to use a camera that takes pictures with a lot of megapixels; my Canon EOS 7D takes pictures with 18 megapixels. Using as small an aperture as the existing light will allow increases the depth of field and lets more things be in focus as the same time. another jaw-dropper. have you considered submitting the photo to bugguide.net for an ID? Thanks, Sarah; I hope those dropping jaws don’t get dislocated, or bruised if they hit the ground. Your idea of submitting the picture to bugguide.net is a good one. I did submit the picture of this fly to bugguide.net for identification. In less than an hour someone identified it as Poecilognathus, which is a genus of what are called bee flies, for their resemblance to bees. Very nice, I like the light and colours. The angle works well too. Thanks. I’ll agree with you. I think that might be the prettiest fly I’ve seen, beautifully photographed. The internet is a wonderful place and I am constantly grateful for folks who are so generous with their knowledge. We have no more excuse for ignorance. Yes, many people have helped me along the way; they and others continue to do so. And without the Internet, all the information in your blog, my blog, and millions of others wouldn’t be available for free to anyone who cares to read them. By having blogs, we reciprocate and do our part in disseminating information—visual and verbal—to other people. Thanks for your comment on the picture and for your clarification on the word proboscis. Because of houseflies, most of us have a certain—and unflattering—association with flies. But this one was pretty and was enjoying pollen in nature rather than the food on the plates in front of us in our dining room. Lasciate ogni speranza, voi qu’entrate. Stunning photo! What a tremendous amount of patience you have, Steve! Thanks, Ariana. Sometimes I do have to wait patiently, but other times things come my way unbidden, as this little fly did while I was busy photographing the sunflower. I’ve also learned to look at the bracts beneath the rays of sunflowers, because spiders and insects often enough hang out there. This is incredible, Steve! The wings look like glass. I’ve never seen anything like it – our bee flies look quite different. Is the fly in mid-air or resting on some part of the flower? Bugguide sure got you an answer fast, it’s such a great resource. You’re right: the wings could be clear panels in a stained glass window. Thanks for suggesting that. From looking at bugguide.net I noticed that the category of bee flies is large enough to include genera and species that can look pretty different from one another; that explains why the ones you’re familiar with don’t resemble this one. To answer your question: this fly had its legs on the vertical yellow ray that you see behind it. Thanks. I’m fortunate that the little fly was so obliging. Awesome photo! Mowing sunflowers is barbaric as far as I am concerned. I spied on the EXIF and saw you use a rather high ISO setting. I am amazed the photo isn’t the least bit grainy. It encourages me to experiment with higher ISO settings too. Glad you like it. And I like your description of mowing sunflowers as barbaric. Because I rarely use a tripod, and because there’s often wind at the places I photograph, I typically use a shutter speed if 1/320 sec. with my 100mm macro lens; if there’s a moving insect or a stronger-than-usual wind, I may go to 1/400 or 1/500 sec. In order to get enough light and enough depth of field with those shutter speeds, I often need ISO settings of 400 to 800. The resulting pictures are grainier than they would be with an ISO of 100 or 200, but that graininess is most noticeable in blue skies. I recently figured out a technique to counteract the graininess in the sky without softening the details of other things in the picture. That’s possible because I always shoot in RAW mode and use Adobe Camera Raw to process each image before opening it into Photoshop. Blue skies? What was that again? A character in a fairy tale, no? My problem is to get some depth of field in bad light. The first forest pictures I tried didn’t work out at all, so I experimented with a path between tall trees the other day and ended up with an ISO 800 (1/60 sec) to get some depth of field with just a partly cloudy sky, mind you. I can’t use a tripod a lot. It’s either too bulky to bring along or it’s inappropriate to use (in a church for example). If modifying RAW files can help with graininess, I better shoot some RAW pics and start figuring out what can be done with them. I didn’t see a point in trying that yet. I take it you’re short on blue skies in Germany; at least you’ve got some rain (I hope). It’s definitely worth photographing in RAW, which preserves the maximum amount of information for you to manipulate later. If you open a RAW file in the current version of Adobe Camera Raw (a component of Photoshop), there’s a slider that lets you reduce the amount of noise (graininess) in an image. Doing so, though, will produce a somewhat softer picture; later you can sharpen key parts of the image if necessary. You can get one of the many books about Photoshop that explain all these things. And of course there are other programs altogether. Many cameras have a setting to let you simultaneously take a RAW and a processed (jpeg) image each time you press the shutter release. With that setting, even if you’re not ready to deal with RAW files now, at least you’ll have them for future manipulation. That is awesome! 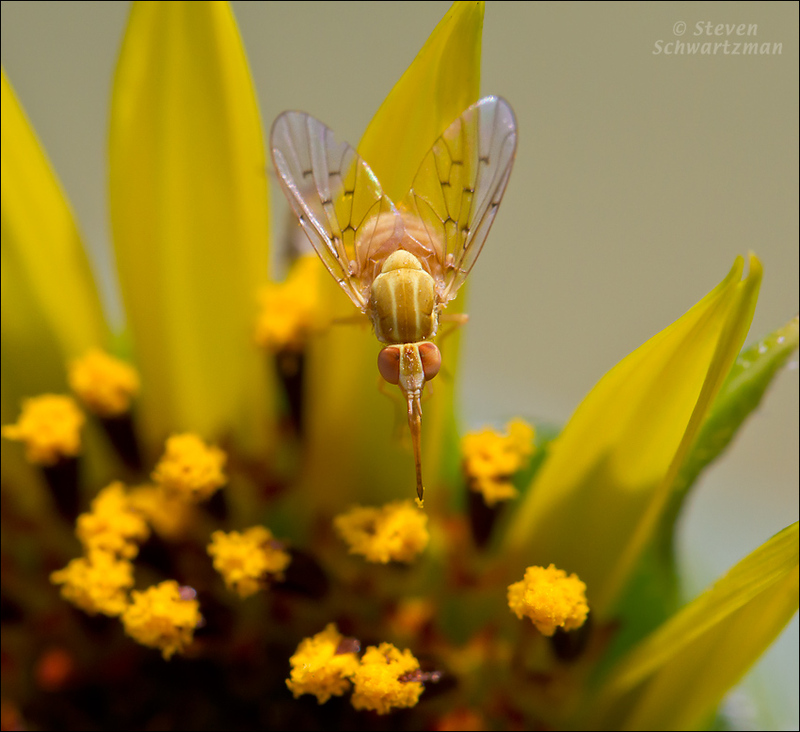 The colors of the bee fly fit so well with the sunflower. On a tour at a prairie a few months back, an entomologist was pointing out all the bee “mimics”, seemingly in greater numbers than the bees themselves. Thanks for finding some awe in it. I’ll agree with you that the colors harmonize. There are indeed a lot of bee mimics, and over the years non-entomologist me has been hard pressed at times to know whether a picture shows a bee or a fly. I went through a part of my archive yesterday and reclassified some pictures. We have plenty of rain year-round. There are regional differences, but in this area we have most of the rain in July. Today I set my camera to take RAW and jpeg images like you suggested. Now I have looked at the fotos I think this is a very good standard setting. Most of the time the jepgs are all I need. But sometimes it makes sense to use the RAWs for manipulation. I already experimented with one photo taken in very poor light. So far I just played with the settings to find out what can be done and I am impressed. The manually adjusted photo is decidedly less grainy and lost just a little detail. Great. I’m glad that you’ve become a convert to RAW, at least as something to fall back on for those pictures that need work. Thanks, I’m pleased you like it; it’s become a favorite of viewers. I thought I hadn’t seen this type of fly before, but in looking through my archives I discovered I did photograph one once, though the recent pictures are better. I’m glad you find it beautiful. Thanks, Gracie. I’m impressed to be in Freshly Pressed for the first time. How did I manage to miss this one! It looks as though it’s dive-bombing its target – fantastic shot. I appreciate your comment, Lu. No harm in missing the picture the first time: it’s still there. The fly looks like it’s dive-bombing its target, but actually it was standing on the yellow ray that’s right behind it. If you look just to the sides of the fly’s eyes you can see, faintly, its two front legs going down. I like the color harmony too; it was my good fortune that the fly landed on a sunflower rather than something less appealing. Congrats on being Freshly Pressed! Your blog sure deserves the honour and more viewers. May you continue to enjoy taking those splendid photos despite drought and mowers. Thanks for the congrats; I had to look to remind myself what Freshly Pressed is. As for more viewers, tell all your friends (well, the ones you think would truly be interested in nature photography). And when it comes to the mowers, I was out this morning at a pond whose slopes were heavily mowed not long ago; scattered about on the ground I saw the chopped up stalks of dozens, perhaps hundreds of sunflower plants—but I found another little plant that had miraculously survived and had a pretty flower; I may show that in a future post. To deal with the heat, I went out at 7 in the morning today. I find macro photography such an elusive skill, so I always enjoy other people’s successes. Thanks for posting. Thanks, Lorna. Don’t feel apologetic about anthropomorphizing: I’ve done my share of it too—and likely will again. Wow! This picture is indeed one of the amazing ones I have ever seen. Really lively! From halfway around the word, thanks. Nice shot and interesting insect. This pretty fly can do a little to counteract the bad reputation that the common housefly has given flies in general. Phenomenal quality! What kind of settings/camera did you use to capture that beautiful photo? I absolutely love up-close shots; I usually try to take as many as I can. Glad you find it phenomenal. The f/stop on this was f/6.3, wider than a usually like, but I was shooting at 1/400 sec. to stop any movement of the fly. If you look at the blog’s sidebar there’s a document called About My Equipment that will fill you in on what I’m using. Most of the pictures in my blog so far have been close-ups, so you may wish to browse some more. I definitely will check that out! Thanks for responding 😀 ! Wonderful! A superb shot – thanks for sharing it with us! My pleasure. It would be a shame to have all these pictures and not share them—so here they are. What a shot! The clarity you managed to achieve on the wings is stunning. It’s clear that you appreciate clarity. Me too. By the way, I’ve encountered a number of nature photographers from Montana who have wordpress blogs. Now if you could just e-mail me some of those grilled eggplants and zucchinis from Greece…. Haha! I’ll work on it with Willy Wonka & see what we can come up with. Wonkavision works for savory foods too, right? how gorgeous! i’ve never considered a fly pretty before but this one really is. thanks for this! There are other pretty flies too, but this is probably the most attractive one I’ve photographed. That’s amazing! Love the colors. Congrats on being Freshly Pressed. I’m with you about the colors. It’s near noon here: can you e-mail me some of those fig tarts you described? I’ve never thought I would describe a fly as pretty but you have proved me wrong. This fly is gorgeous! And the fact that you are able to capture its beauty is absolutely amazing! Thanks for sharing. In this case I’m happy to have proved you wrong. You called it, London caller. I really like the apical cells in the wing, and how you can see all their different parts, almost like it’s under a microscope! But so much better. Wow. Thanks, Laura. Your comment makes it clear that as someone who draws you’ve spent a lot of time observing things. Thanks. I’ve been living my dreams through photography. There are plenty of other works posted: have a look around. Wow! I can’t stop looking at this. That photo IS pure poetry. Simply amazing and the yellow just mellows you out. Very nice work and congrats on being FPed! There are lots of beautiful things out there in nature. I’m happy to have inspired the Inspired Poetess—and to have mellowed her out. Incredible shot! The fly is so detailed! Nice work! Thanks. And think of all that detail in such a tiny creature. Awesome pic – the detail of the fly is amazing. Congrats on being FP! Gorgeous photo! I love the detail! Congratulations on being freshly pressed! Thank you, Food, Flowers, Herbs and Life: I’ll take some of each. I was fortunate that everything fit together so well. Thanks. Thank you. And I, who extol wildflowers, can’t help remarking that the name Blumenthal means Dale of Flowers. How appropriate. What you just wrote lives up to your motto of “words with purpose.” I’m glad to hear your advocacy of native plants, and thanks for your appreciation of this picture. Very interesting creature…and a great picture. There are all sorts of intriguing plants and animals out there; I’m glad you appreciate them. My congratulations also for Freshly Pressed- a great image as always! Beautiful and Delicate Work of our Lord Jesus! This photo is amazing. I’m just starting out in photography so I hope I can take pictures like this soon. The more time you invest in it, the more likely you are to get good results. I’m glad you find the picture Grace-ful. You’re right, Sally: the macro lens reveals all sorts of things we couldn’t appreciate without it. It’s the lens I use the most often. And you’re right that the limited the tonality of this image adds to its appeal. It’s not something I planned, but I was there at the right moment. Sure, come back any time. Flies scare me, but that is a beautiful photo. Thank you for sharing! Nothing to be afraid of in this pretty little flower-loving fly. It is an incredible photo! I love it. I appreciate that, Cindy, coming from someone who knows her way around a camera. I’m glad you got Freshly Pressed too. You’re right that it’s fun; it’s work too, to answer all the comments, but I’m not complaining. Yes, I’ve had multiple times as many page views today as on my previous best day; about two-thirds of those views, not surprisingly, have been of the pretty fly, but that still leaves a lot of spillover onto other posts. I’ve also picked up a few subscribers. Wow! what an amazing close up of the fly! it blew me away! I’m glad neither my camera nor the wind blew the fly away. That is a crazy looking insect! Good shooting! But consider what the insect might think we look like. Definitely the prettiest fly I have seen! I got lucky with an insect once as it crawled slowly over some flowers, allowing me to take several photos. Maybe I should submit mine for identification, too. There seems to be a consensus that this an unusually pretty fly. Going to bugguide.net is a good way to identify an insect. Thank you for sharing your photos. You of an artist’s eye! Wow !! Amazing shot. The motion is frozen so perfectly, it just adds to the composition. Thanks. I used a shutter speed of 1/400 sec. to try to freeze small movements of the fly. Interesting photo! What a stroke of luck to have captured this little one in your picture. PICTURE PERFECT!!! Thank you. I’ll agree that I was fortunate. But fortune favors not only the person who is prepared but also the person who is present. I think anyone who spends enough time in nature will see new and intriguing things. Beautiful bee fly & photo! Thanks. what a remarkable capture! i also caught a weird grass green fly the other day. so many fascinating insects! thank you for sharing. The good thing about insects is that we never run out of them. Thank you. Being featured in Freshly Pressed did wonders. He is rather pretty – I love his glasslike wings. Yes, the glasslike wings are a nice touch, aren’t they? Perfect! Your picture is one in a million. Photos of flowers and insects are some of the most rewarding pictures I’ve taken. According to Freshly Pressed it’s one in 382,761, but a nice round number like a million sounds better. I’m glad that you’ve found photos of flowers and insects rewarding too. I have bit of a phobia of flies, but I found myself captured by the beauty of this little creature. Thanks for sharing! I imagine the phobia comes from things like houseflies and mosquitoes (which are also flies), but this pretty fly seems to appeal to everyone. It isn’t just the subject that is stunning, it is the clarity of the picture. I could look at shots like this all day. For some reason nature really does it for me. Water falls and rain forests are a particular favourite. Thank you. We could use a bit of rainforest in Texas now. We were there six years ago, but it was primarily for a wedding. That reminds me: when I was out walking near Wollongong one day I came across some lantana, which is native in Texas, growing as an alien invasive there. Wow, what a brilliant capture! Thank you for sharing this moment. You’re welcome. And I noticed you quoted William Carlos Williams: “In summer, the song sings itself.” Some rain here in Texas would help summer to clear its parched throat. Merci. Et la p’tite mouche vous remercie aussi. Breathtaking! How did you get such incredible details. Wish my bees came out this sharp – they always look a bit smudged! Thank you so much for sharing! Thank you. There are several answers to your question: I use a camera with a high resolution, plus an excellent macro lens; I’ve had a lot of practice holding the camera steady; in this case I used a pretty fast shutter speed of 1/400 sec. to try to suppress any movement. Bees usually move about a lot more than this little fly, whose movements were small. Thank you for the great tips! I’ll remember that when I join the macro club. Look forward to seeing more amazing pictures of the microcosm from your macro-perspective! I didn’t realise bees move more than flies either, really interesting. I think I’ll practise with butterflies along the canals this afternoon. Some types of flies move around more than this little one was doing. With butterflies, there’s lots of variation: some are willing to let you get close, but most aren’t. Good luck. Thanks, and welcome to the macro club. wow i have been trying to take beautiful macro shots of flora and fauna but they have not tured out as great as this. Rest assured, not all the pictures I take turn out this well either. I keep practicing, beyond which there’s sometimes an element of luck: this little fly landed right on the flower I was already photographing. The photography may be cool (thanks), but I can assure you that being out in the summer in Texas is anything but. Super photo…!!! I just got a macro lens and have yet to get a good shot. Thank you. Although most viewers have been fascinated by the little fly, you are the second dissenter. In any case, we’ll agree that sunflowers are beautiful; I’ve posted a bunch of pictures of them so far. I’m sorry that insects frighten you. They appear in this column from time to time, but there are plenty of pictures without them that you can feel more comfortable with. beautiful photo. nature is so amazing. Yes, it can be amazing. Thanks. To be able to capture such beauty at this magic moment, is beyond description of my words. Thank you for sharing your wonderful work and congrats on making FP. Thank you, fellow dweller in Texas. You just reminded me of a song from the 60s, written by D. Pomus and M. Shuman and made popular by Jay and the Americans, called “This Magic Moment.” Although I spend a lot of time taking pictures in nature, some moments there are indeed magical. Thanks. It has become a favorite. This is the most interesting blog I’ve ever visited, so far. The author is so kind to answer all of the comments and the comments are also broadening my knowledge ’bout this photo and also photography. Well done, Steve! Now I follow your blog. That’s a first for me: someone saying this is the most interesting blog he’s visited. Thanks, Imanuel. A beautiful shot of dragonfly. Congrats on being Freshly Pressed! Thanks, Jean. I’m afraid cycling through these comments is the only cycling I’ve done lately. Thanks, G.F. I’ll commiserate with you about the difficulty of getting a publisher interested in your work. Wonderful picture! I’ve never seen such a beautiful fly. That’s been most people’s reaction, Jessica. I’m pleased that it’s yours too. Maybe this picture will encourage some people to study entomology. Where there’s one unexpected treasure, there are probably plenty of others. Think how many things must be out there that we don’t normally see. I’m glad this one appealed to you. Stunning photograph Steve! Congrats on Freshly Pressed. Your work really inspires me. Thanks. The Freshly Pressed came as a surprise. Happy inspiration: I’m inspired by what I keep seeing in nature. Very very neatly taken snaps. Bravo ! Thank you. Let’s hear it for art. Love the photo! I am most pulled toward the crumb of pollen honey–which you captured so well. Fascinating to see “such” a speck of nourishment giving life! Thank you for sharing. I’ll agree, that bit of pollen was a lucky bonus. It shows us that not all flies are attracted to things we find distasteful. I am so happy that I stumbled across this photo on ‘Freshly Pressed’ this afternoon, I wasn’t even sure how to leave a reply as I am only a week old to wordpress.com and blogging, but this is nirvana. As an avid biologist, geneticist, nature lover and amateur photographer who LOVES to make gifts with photos, ephemera, write calligraphy quotes and share with others, I am so happy you shared this shot with me/us. I cannnot get over the detail of the wings, or the pollen captured on the proboscis (sp?) It’s amazing, I just keep staring at it and am so intrigued by the handiwork of God, this is breathtakingly detailed and a glimpse too many of us never get to experience. I am so glad that your lens caught this. I am now following you! Thanks for your detailed (and favorable!) comments, which make it clear how much nature means to you. I read Thoreau when I was in high school, so I appreciate your quoting him on your site: “Go confidently in the direction of your dreams.” It’s only in recent years that I’ve come to appreciate his affinity for nature. F l a(y) l e s s ! Ah, another person who likes to play with words. I’m pleased that you found the picture impeccable. Super shot, lovely detail and great composition, very nice indeed. That’s a nice compliment, especially as it comes from someone who has done such fine extreme macro work. I looked at your blog and would encourage anyone who reads this to do so as well. I’ve been aware of the Canon MPE65 for some time but have never seen work done with it till now. Looks like you’re having a lot of fun. Thank you Steve, I am pretty new to this blog business so when I work out how to link I will link to your blog as you have done with other nature sites. Re the mpe, it is a great lens though the manual focus and shallow DOF provide a few callings. I use a flash for all macro work with this lens. The flash is the mt24ex similar to your ring flash, just have to be careful with hot spots. Look forward to seeing more of your work, are you on Fine Art? I’m not familiar with the Fine Art you mentioned: where can I find it? Search for Fine Art America and the join as an artist, thats free but there are limitation or else there is Red Bubble which is also free with no limitations. I can’t help adding—modestly, of course—that one awesome user of the camera played a role too. I think everyone has said everything there is to be said about this awesome photo. I still need to say Wow! This is just amazing! No matter what else has been said, I’ll never turn down another wow! This is truly an amazing shot!! I’m happy to amaze. Thanks. Very cool! Almost like under the microscope. Glad you like it. The insect is a bee fly, which is still a kind of fly. You’re welcome to keep looking: it’s not going away. Considering that the aperture was as open as it was, f/6.3, I was fortunate to get so many parts of the fly in focus. Yes, fortunate indeed, its nearly perfect. Did you use a tripod? I tried to get a bee one time & struggled to keep it still, I didn’t have my tripod on me when I was shooting. No, I don’t generally use a tripod. This fly moved around less than bees typically do, so I understand what you were up against. This is an amazing photograph, much deserving of all the praise. The delicacy of the wings is so appealing, and the way the little bugger (no… well, okay, pun intended) matches his background is incredible. Way to go, man! Thank you. I’m still taking plenty of pictures in the heat, so my photography is not “gone with the summer.” I don’t know if the same is true for the little fly. I used a Canon EOS 7D with a Canon 100mm macro lens. Most of the pictures I’ve posted in the nine weeks of this blog were taken with that combination too. To do detailed closeups you pretty much need a macro lens of some sort. WOW!!!!!!! Please tell me, what lens are you using? what are the settings? soooo beautiful. I’m in awe. Ahh I see… the answer is right above. I am in awe! That’s all! Thanks. I’m grateful that Freshly Pressed has brought me more viewers than ever before. Can I draw you out a bit more on that? What an amazing photo! Thanks for sharing. I’m pleased to share such an appealing little fly with everyone. Really great timing of yours. Did you edit even a bit of this image or is just the original one? The only editing was the usual, for brightness, contrast, dust spots, etc. For this picture I set the shutter speed to 1/400 sec. to try to stop any movement the fly might have made; the corresponding aperture that the camera chose, based on the amount of light available, was f/6.3. I usually prefer a smaller aperture for greater depth of field when I’m so close to a subject, but this time f/6.3 was enough to bring the important things into good enough focus. That’s what you say—and I’ll agree. Thanks. Thanks, Subhash. I’ll take brilliant in both senses of the word. It’s fascinating that even something as mediocre as a fly can be so pretty. Great job catching the moment, and the different shades of yellow are very pleasant to the eye. My sentiments too, thanks. Yellow has long been one of my favorite colors. Fabulous Fly!! Love the translucent wings! I am a passionate amateur photographer myself and Nature is my favorite subject. You’ve come to the right place: plenty of nature here. I wish I could go to Goa. Love this photo! You have captured such a beautiful master piece of creator! I’m glad you see it that way. Yes, nature can be amazing. Hi Steve, this picture makes me want to imagine being an insect, like a butterfly, hopping all day long from flower to flower. Must be like being in heaven. It’s fun imagining, and it may be like heaven—until a dragonfly or assassin bug or spider or robber fly takes a chomp out of you, all of which I’ve seen. A wonderful photo. The nature is wonderful nice. If all flies were beautiful like this, I would always let them in my house and never chase them! Thank you Steve for sharing that wonderful picture! You’re welcome. I think we all wish every fly could look like this little one; as you said so well, we’d let them in our houses and not chase them. Rimbaud a parlé du «bourdon farouche / De cent sales mouches» mais cette petitie mouche solitaire ne bourdonnait pas et n’était pas du tout sale. I love the colours, the wings on the fly have such a lovely pattern, super photo! I wonder if the sunflower pollen is good for people to eat. I love the picture! It’s definitely a very pretty fly, though I’m not a fan of flies, he’s definitely very colorful. Yes, it’s enough to alter our conception of flies, or at least some flies. Hi Steve. This is fantastic. The composition of the picture is just perfect. I always believed that the world does look a lot different when seen through a camera. This is just a perfect example of that. You have brought to life the world as it would look like for a bee. Brilliant! Thanks so much. I do often try to show a different perspective. I must concur w/everyone else – this is a breathtakingly beautiful photograph! Congrats on getting “Fresh Pressed” too! Curious what lens you used & if you have a flickr? Happy concurrence. For this picture I used my 100mm macro lens. I set the shutter speed on my Canon EOS 7D to 1/400 sec. to try to stop any movement the fly might have made; the corresponding aperture that the camera chose, based on the amount of light available, was f/6.3. I usually prefer a smaller aperture for greater depth of field when I’m so close to a subject, but this time f/6.3 was enough to bring the important things into good enough focus. For the past nine weeks I’ve been putting my photographic energy into this blog. I don’t maintain a flickr site, but feel free to send your flickr friends this way. WoW! This is an awesome shot of an amazing little bug! The details on the fly are incredible. What I liked most about the photo is that you can actually see the fly carrying the pollen! Again, this is a beautiful shot. If you find a moment, please visit my photoblog at the link provided below. I am fairly new to photography so any advice will go a long way. Thanks! I’m glad the details in the picture appeal to you. That bit of pollen in the fly’s proboscis made the image special for me too. Absolutely gorgeous photo. The detail on the fly is amazing. That’s where a good macro lens is indispensable. Wow~What a clear and beautiful photo you caught!! Great shot!! It’s clear that you like it, which is clearly a good thing (says me). Wow , It’s a great shot !! nice color and composition.. Thank you. Everything worked together. I have never ever seen a fly with such clarity…its looks amazing. You certainly have an eye! Thank you. Clarity can be a virtue. I’d only seen this species once before, years earlier. I’m grateful for all the congratulations. I love your photo! Awesome! Cool shot, and congrats on being freshly pressed! Thanks, Rob. I like your picture of bubbles and colors. nice post! 🙂 your camera clarity is superb. Nikon i suppose? Thanks. My mind’s clarity is sometimes superb too. As for my camera, if you check About My Equipment you’ll find that it’s not that other brand. woah! That is a lot of information about cameras and lenses. Have you done a photography course? or is photography your passion? just curious. No, I’ve taught myself. And yes, photography is a passion. the fun and magic of photography comes when it is not taught by a teacher, i don’t know why, but that is what i have seen. anyway, you are indeed very good at it. Although I’ve learned photography on my own, I’m not against teaching: in fact I’ve been a teacher (but not of photography) on and off for my whole adult life. In any case, I’m happy that you think I’m good at what I do. This the most beautiful pic I have ever seen!!!!!!!!!!!!! Thanks for all the exclamation marks. My sister showed me a hummingbird moth yesterday, a little moth that zips back and forth to the nectar in a flower. I guess that you could say like a humming bird does with wings that move so fast you can not see the movement. We live in Montpelier, Vermont. Hummingbird moths have intrigued me as well. On only a few occasions have I been able to get any good pictures of one. Thanks, I’m happy to share this. The Internet (in this case bugguide.net) is great for finding information—and of course the Internet has also made this blog possible. There are dozens of excellent cameras these days, so it can be hard to pick one. I’d recommend checking out the thorough reviews available at dpreview. Nikon digital cameras are easy to use and have easy to use software and support cables for your laptop. This IS an amazing photo, thanks for sharing! You might like Viewbug.com. You can join for free. I am a member there. You can look me up under jessicaber2011. You can post your pictures for sale there in your own online store. They have photo contests and some clssy group activities. It is nothing like Faebook. It is for photographers. Thanks for the information, Jessica. I’ll check out that site. I told my sister about your blog this morning. You have the most articulate, meaningful and beautiful blog that I have ever seen. Oh, ok. There you go. It seemed scientific and intelligent. Teachers have definitely accepted one of God’s callings as well. I’ll agree with you. Ευχαριστώ. I laughed at your title. Here in the Philippines, a fly is nowhere pretty. Hardly any Americans think of flies as pretty either—until they see one like this, and then they change their minds. Very true. This one seems to be an exemption. The symmetry, structure and color is amazing! Agreed. Coincidentally, a few days ago I photographed another one of these, even smaller than this one, also taking nectar from a sunflower. Wow, that really is a beautiful fly. Excellent macro! And congrats on FP, quite an accomplishment! Thanks, Candace. By coincidence, just this morning I saw another one of these flies on a sunflower. They’re very tiny and therefore hard to notice, but the good news is that when I do notice them they’re not skittish as long as I move slowly. Dickering around with the “random post” this morning on one my favorite photography blogger sites, I discover this beautiful macro shot of an insect against a brilliant background of yellow — two more favorites of mine. I felt the need to reblog this post (having nothing of my own this AM), but am surprised to discover that this shot was also Freshly Pressed back in July last year. Much deserved, my friend! You bring visual joy to my day every day. For my non-blogger followers, you must visit his site for some stunning photography of wildflowers in the central Texas region. You will not be disappointed for your time. Amazing shot! I never really thought of flies feeding off of flowers that don’t, you know, smell like rotting flesh. Good tip on the bugguide.net, too — I’ll definitely have to remember that one. Thanks, Sarah. Our association with houseflies (not to mention mosquitoes, which are also flies) has tainted the whole group, I’m afraid. There are many flies that look like pretty little bees but that don’t sting. You can see some of them at bugguide.net, which you mentioned. Wow. Absolutely stunning detail – time to get a macro lens I think. A macro lens reveals all sorts of things that we couldn’t otherwise see. I used one for the majority of pictures in this blog. Highly recommended. #LoveLoveLove the first picture!! The second picture is a little too close up for my liking.. lol.. (downright scary.. *chuckles* ) BUT I do have an appreciation for the clarity of the pictures – absolutely amazing! Thanks for taking the time to share the links with me! I really appreciate it! A very popular little fly and deservedly so. The fly’s popularity is deserved, but the huge number of responses came from the fact that this post got Freshly Pressed. ¡Bravo! Quiero sumarme a esta larga lista de opiniones porque me parece que el trabajo que has hecho es impresionante. La imagen es sumamente didáctica. Es lo que se debería esperar de un profesor eterno. Very nice! I photographed one this year in my yard. Never had seen one before and thought they were interesting. I was researching as to what it was and also learned they can fly backwards. We had quite a few in the yard for a week or so then they disappeared. Thanks. From what you say about photographing one of these in your yard this year, I suspect they’re fairly common, but so tiny that most people probably don’t notice them. Without a macro lens, I’d have had no way to appreciate any creature so small. Thanks, and welcome to the world of nature in central Texas. Definitely impressed, Steve. It is gorgeous. Thanks, Tanja. This picture became an early classic. Due to getting Freshly Pressed, this post garnered far more comments and likes than any other. You were off to a good start, and are still going strong! You get an A+ for doing your homework, Steve! Even I remember that sweet yet devastating song, Steve (even though I was not among the living yet then). We’re glad you’re among the living now. Why Joan Baez chose to sing the song in German, I don’t know. She also sang a song in Portuguese that got me interested enough in that language to study it. How interesting, Steve. How much Portuguese have you retained? I can still read pretty well, and if someone speaks slowly and clearly enough (which speakers of Romance languages tend not to do) I can follow along. Speaking is the weak link because I’ve rarely done so in the intervening decades, though I still remember a lot of irregular verb forms. Yes, I thought you’d feel that way about it.